After a buyer has expressed the desire to purchase a For-Sale-by-Owner home, the negotiation starts. 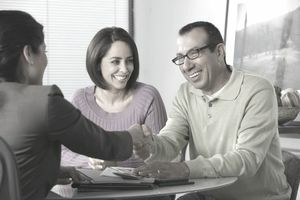 As a For Sale by Owner, you are in a unique position to negotiate directly with the buyer, providing you are not paying a buyer's agent fee. If you are paying the agent who brings you a buyer, you will probably negotiate the purchase contract through the buyer's agent. However, if you are not paying a buyer's agent and you are negotiating only with the buyer, you might need to help the buyer find a For Sale By Owner contract. So stock up on for sale by owner contracts that you can easily complete for the buyer to sign. Buyers may write different offers depending on the climate of your market. Review how buyers write offers in a buyers' market to the way buyers write offers in a sellers' market. Think about asking the buyer for a contingency offer, which could be subject to you finding your replacement home. If you are concerned that you won't find a suitable home, making your offer contingent on it is one way to guarantee you won't be homeless. On the other hand, the buyer might ask you for a contingency sale. Handled correctly, you can always bump the buyer out of the deal or force the buyer to remove the contingency if a better offer comes in through First Right of Refusal. Expect that you might need to compose a counter offer. You don't have to accept the buyer's offer, and if it is too low, always counter; don't walk away. Sometimes buyers want to test the water by poking in a toe. Don't be insulted if they try to take advantage of you. When selling as a For Sale by Owner, it might possibly be prudent to obtain your own home inspection before putting the house on the market. This way you know what is wrong and can fix it or otherwise address it. Plus, you can give the buyer a copy of your home inspection, which the buyer might accept in-lieu-of hiring another inspector. A real estate agent will not advise a buyer to accept your inspection, but unrepresented buyers won't know any better. Before paying for your own inspection, stop to consider your home inspector might find different defects than the buyer's home inspector. In many parts of the country, buyers ask for pest control reports from the seller. It's better to get those inspections completed before entering into a purchase contract, otherwise, agree that specified reports are subject to your approval since you will not know upfront if repairs are indicated or required. You don't want to agree to pay for pest work, for example, and then discover it will cost $30,000.